First wave. Second aircraft to attack Eder Dam. Mine overshot. Aircraft damaged, and shot down on return flight. Robert Urquhart was born in Moose Jaw, Saskatchewan, Canada on 2 August 1919, and had worked as an apprentice jeweller and a stock manager before the war. 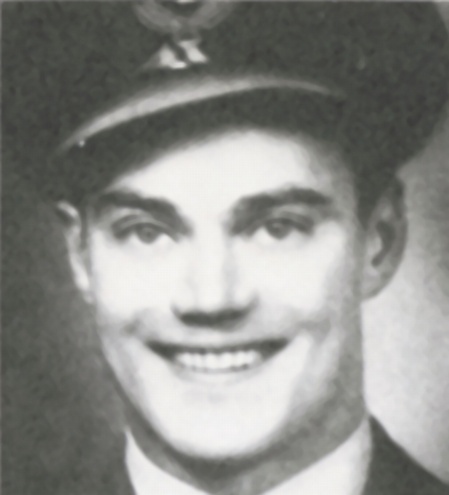 He applied to the RCAF in May 1940 and joined up in January 1941. He was initially selected for pilot/observer training and finally qualified as a navigator with a commission in January 1942. He arrived in England in March 1942, and underwent further training. At one point he flew with Joe McCarthy, later to become a 617 Squadron colleague. He joined 50 Squadron in August 1942 and undertook 15 operations with Sqn Ldr Moore as pilot. On 17 December 1942 he joined another crew, piloted by Sqn Ldr Birch, whose rear gunner was Richard Trevor-Roper, in a raid on Soltau where, although injured by flak by a Ju88 attacking from below, he continued to navigate with accuracy. In the New Year, he teamed up with Henry Maudslay almost immediately after Maudslay resumed operational flying in 50 Squadron in January 1943. Maudslay and Uquhart’s first operation together was to Essen on 21 January 1943, and they flew another 11 operations together until the whole crew was posted into 617 Squadron on 25 March 1943. On 4 April Maudslay and Urquhart flew to Farnborough and stayed there several days whilst modifications were undertaken to their Lancaster which included the fitting of two Aldis lamps so that the pilot could maintain the correct height for the attack on the dams. One was located in the front camera slot by the Bomb Aimers position, the second fitted in the rear of the bomb bay. The beams were adjusted to form a figure of eight (two touching circles) at the required height, and could be seen just forward of the leading edge of the starboard wing. The navigator could clearly see the circles through the Perspex blister on the starboard side, and could advise the pilot to adjust his height. On their return to Scampton, Maudslay and Urquhart made test runs across the airfield and then later the same evening at Skegness and in the Wash, which showed they could successfully keep to the required height. After further training, the crew took off on the Dams Raid on 16 May 1943, and never returned. After they were shot down near Emmerich, Robert Urquhart, Michael Fuller and William Tytherleigh’s individual remains could not be separated and they were buried together in a joint grave. Since joining this squadron, Flying Officer Urquhart has flown on many operations. At all times his navigation has been of the highest order and the successes he achieved are due in no small measure to his skill. This officer took part in the daylight raids on Le Creusot and Milan and at other times on many heavily defended German targets. On one occasion during a low level raid on a target in North West Germany he was wounded by anti-aircraft fire but continued to navigate with accuracy. By his skill and determination Flying Officer Urquhart has set a high standard among his fellow navigators. In fact the recommendation had been made originally on 20 March 1943 by the Commanding Officer of 50 Squadron, and endorsed by Air Vice Marshal Cochrane on 4 May 1943. Unfortunately the paperwork got ‘lost’ in the corridors of officialdom until the closing stages of the war. The Canadian Minister of National Defence for Air wrote to Mr and Mrs Urquhart on 30 July 1945, apologising for the delay in the award and enclosed his ‘Operational Tour Wing’ and certificate. His DFC was eventually sent to his mother by registered mail on 7 November 1949, along with the Canadian War Memorial Cross. Robert Urquhart is now buried alongside his comrades in Reichswald Cemetery. Previous Article BBC Dambusters Pictureboard completed!